At a Glance: Hip, trendy, noisy, lively seafood restaurant that will make you think you were transported to a Las Vegas hotspot. Food quality top notch, one of San Diego's best new restaurants. I'll admit it - San Diego's Gaslamp has never been my first choice for a dining destination, mainly because so many of the restaurants are geared towards tourists and conventioneers. But that's changed now that Lionfish Modern Coastal Cuisine has opened, smack in the heart of the Gaslamp. The menu is creative, thanks to Executive Chef Jose “JoJo” Ruiz, notably thechef de cuisine at San Diego’s Ironside Fish & Oyster Bar, one of my favorites in Little Italy. He focuses on creating modern and creative dishes, some "sharable" and others full size entrees. The seafood is ultra fresh and sustainable, like this fabulous bite of salmon. A lot of times sushi is disappointing outside of actual sushi restaurants but no worries here. 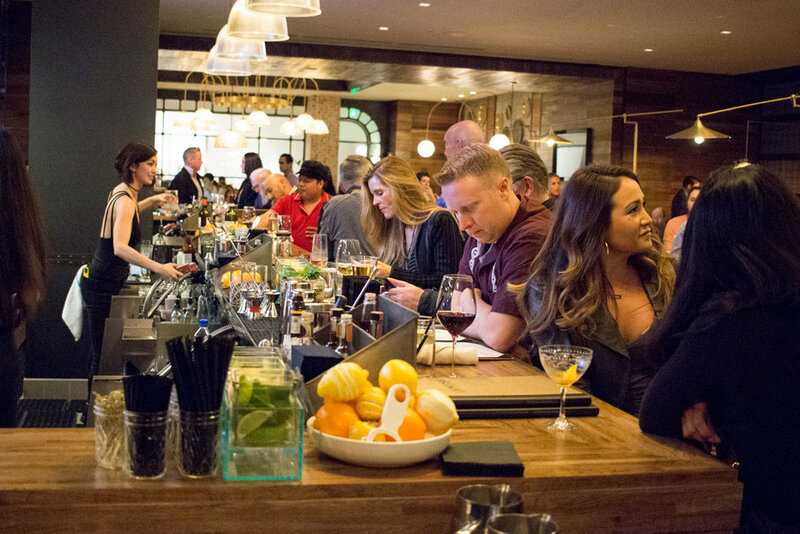 Grab a seat at the bar, order up off the raw menu, happy happens in San Diego. Equally impressive was the New York Steak Tataki, lovely bites of thinly sliced ultra premium beef served in a garlic Ponzu sauce. Delightful! As for entree's, the NY steak was insane, 20 oz. of deliciousness that, dare I say, beats Ruths' Chris and Flemings. Tender, perfectly cooked, and spiced and sauced to make this one of the most satisfying and decadent steaks you will ever eat. I love steak so trust me on this - this is one hellava good steak! They also have duck, chicken, pork chops, scallops, and fresh catch seafood options. No one goes home hungry. Sides are a la carte and prepared with the same sort of care and quality as the rest of the dinner. In other words, really good stuff and bit enough to share. Lionfish in San Diego is the real deal, a hip and upscale dining experience that should delight both locals and visitors. It's fun, it's happening, it's the new hotspot in the Gaslamp that deserves your attention and appetite.